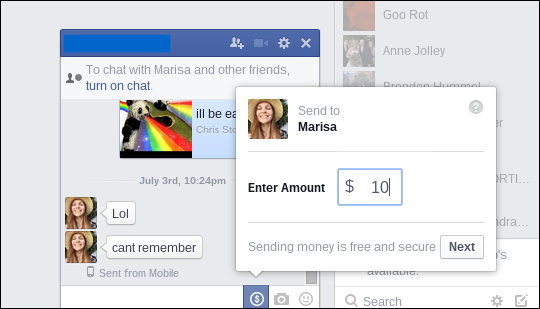 You may not realize it due to the quietly managed launch, but did you know you can send money to your friends using Facebook’s new Messenger Payment system? That’s right, just by clicking on the little coin icon at the bottom corner of your chat, you can transfer nearly all the money you want to anyone on your friends list in a snap. To send money using the desktop client, start by opening up a chat window with the person you’re trying to send money to. At the bottom of the chat window, you’ll see an icon that looks like a small coin. Click this, and you’ll be greeted by the initial prompt. Choose how much you want to send (up to a limit of $500 for new users), and click “Next”. Once the information is approved, click pay, and you’re done! 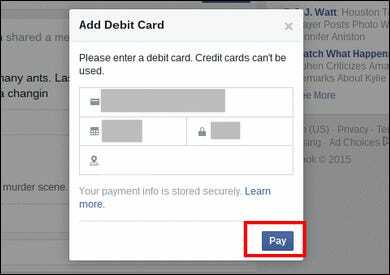 The recipient will have several different options for cashing out of their Facebook profile once the money goes through, including depositing it to a checking account, or spending it on Facebook merchandise through the company’s store. 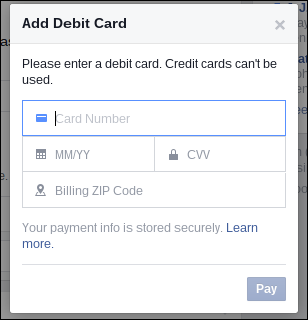 After you make your first successful payment, Facebook will flash a prompt asking you if you’d like to require your password to be entered for any transactions after that. We recommend you take advantage of this because you never know when someone might hack into your account and try and use your information to fleece unsuspecting friends of their spare coin. 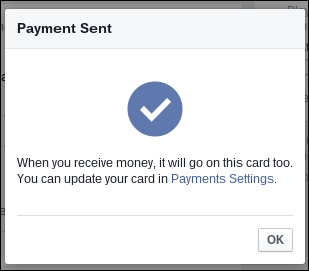 Furthermore, although Facebook will automatically save your payment information after the initial transfer, you can go into your personal Payment settings to remove the debit card to prevent any potential hackers from getting their hands on your money and sending it to their own accounts somewhere overseas. 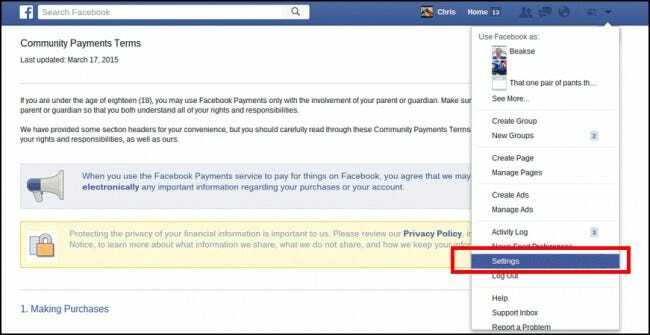 To get to your payment settings, select the drop-down menu at the top of your page. From here, go to “Settings”, where you’ll be greeted by this screen. Once here, you’ll find several different sections that will allow you to manage everything about your debit card and associated financial information in the “Payments” tab, highlighted below. Here you can set the currency you want to use to process your payments, add or remove a debit card, and change the setting for the password associated with each payment. You can also keep a close eye on your transaction history, just in case any transactions were made without your prior consent. And as you should with any payment services, always be on high alert for scams. As Facebook Messenger Payments continues to gain traction in the first few months of its release, more hackers and scammers are ditching their old schemes from the likes of PayPal and instead focusing their efforts on the social network and its 1.4 billion some-odd base of daily users. If anyone you know or that’s on your friend’s list attempts to request money from you without any prior communication about the amount first, be sure to contact them — preferably by phone or video chat so you can confirm that they’re the person who’s actually using the account at that time. Just sending them a text doesn’t necessarily mean that you’re talking to the right person. This goes double for larger amounts, and never give out your personal information to anyone in this context unless you explicitly know beforehand that they are in fact the person who’s asking for the cash. 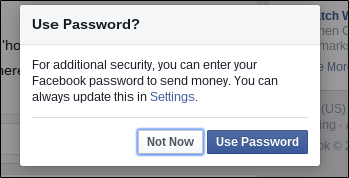 Facebook covers many of the different types of techniques that scammers will use to try and squeeze you for money on its FAQ here. Lately, we’ve been seeing this money transfer feature pop up from social media companies who are either desperately trying to diversify their limited business model (Snapchat, we’re looking at you), or just need an extra flow of cash to start pouring in that isn’t based on speculation and the so-called “user bubble”.